November 2015 – Gina Diamond's Flower Co.
What this tells me is that “Maw Maw” salads are still alive and well on our Thanksgiving tables. You know how everyone rolls their eyes at the sound of a jello salad mixed with fruit and other goodies? If I tried not offering it on Thanksgiving Day, my boys would start a revolution. They eat it with their meal, for dessert and sometimes even breakfast! 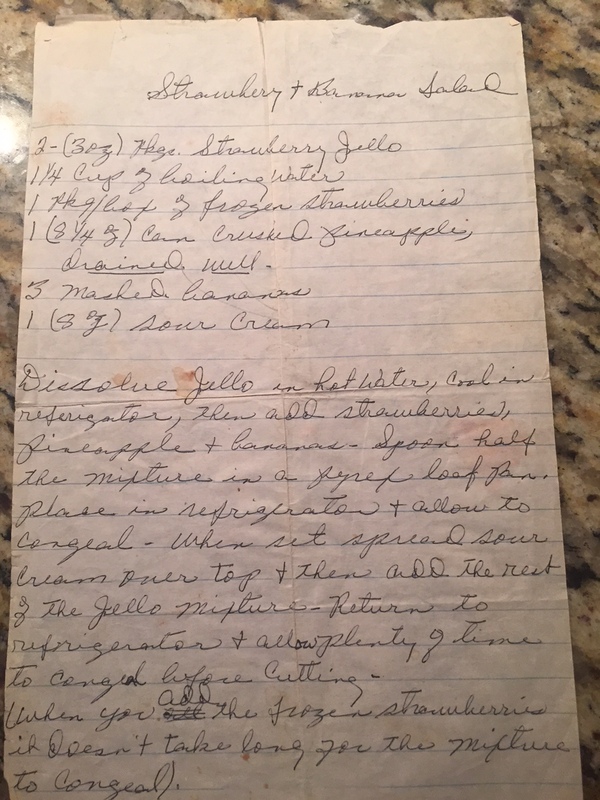 This was my mother-in-law’s recipe and is in her handwriting but I take credit for the food spills on the paper. She made this in a Pyrex dish and cut it into squares but I like making it in a trifle bowl since it is very pretty when complete. So, you probably fall into one category or another on green beans; fresh and crunchy or canned and soft. I like them both ways, but my family likes them soft. 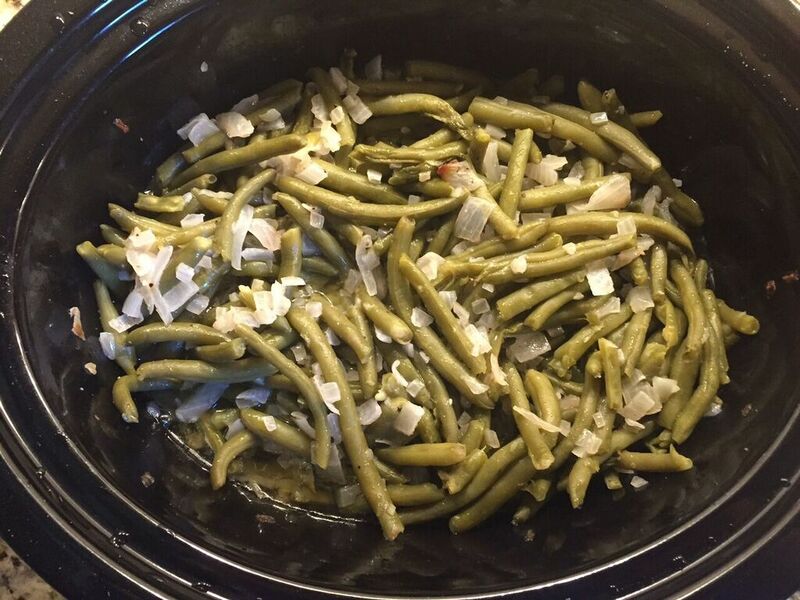 Put green beans in a crockpot and gently stir in all other ingredients Cook the green beans on high for about 4 hours. The flavor is so delicious. I will confess that sweet potatoes are not my favorite thing. I like the color and want to love them, but I just don’t. That does not stop my family from loving these and so I prepare them. It is a labor of love. I have never had a set recipe or even one that was handed down to me from any side of the family. 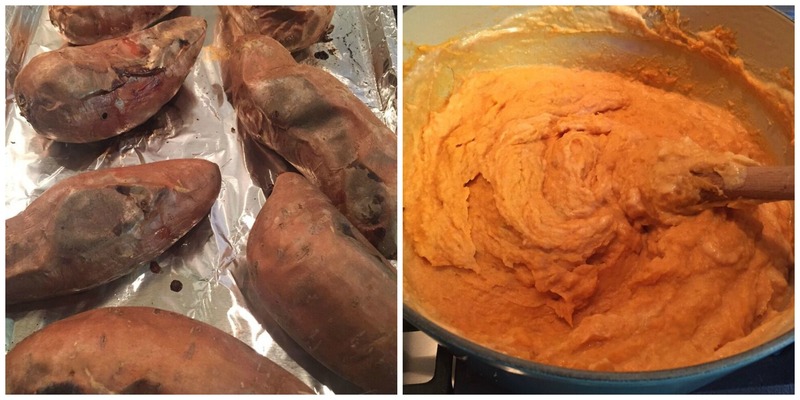 A friend and frequent reader of petals and plates, shared a wonderful sweet potato recipe for me that her family prepares every year. They feed about 30 people so I changed this a bit for my 6. Take out of oven and let cool for about an hour. Add 1 cup sour cream, 1 cup heavy cream, 1 cup milk, 1 tablespoon cinnamon, 1 stick of butter and mash until well combined. Pour into a 9 x 13 baking dish and top with marshmallows. Bake until marshmallows are melted and slightly brown. When I first started preparing Thanksgiving dinner over 30 years ago, I was surprised that with all the starchy vegetables, my husband still wanted mashed potatoes. Another labor of love, I prepare them for him. I like mashed potatoes but it just seems that one more starch is not necessary but my husband told me that what Thanksgiving is all about. If I made a million of these, my boys would eat every one of them. These are really easy unless you can’t get the shell off the egg. As you can see from my photo, this happened on one of them that I prepared. I boil my eggs with a bit of salt and about a tablespoon of white vinegar for 15 minutes, turn the heat off and let them sit for another 5 and then immerse in ice water for about 30 minutes. I am not sure about the science of all that but over the years different people have given me tips and now I incorporate all of them. It helps if your eggs are at least 1 – 2 weeks old. Mix all ingredients until creamy. You may need to add more or less of the ingredients depending upon your preferences. We’d love to hear about your Thanksgiving recipes and traditions. Please leave us your thoughts and comments Click on the title of this post and comment form will open up at the bottom of the page. 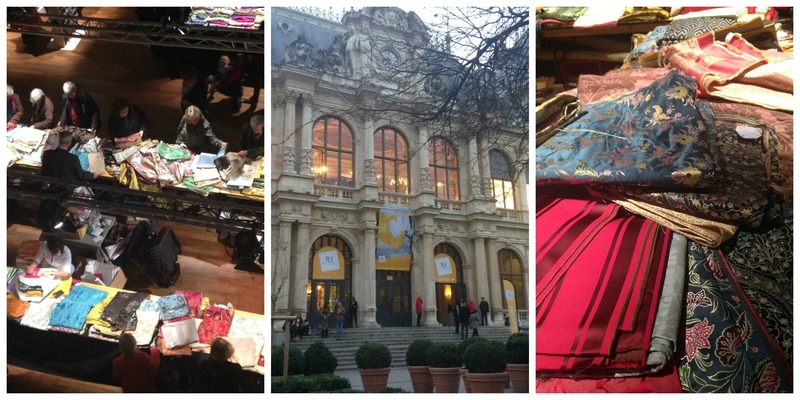 November 22, 2015, posted by Michelle – Every November, Lyon hosts an annual Silk Market and we never miss this unique opportunity to shop for silk and items made of silk all in one place. For centuries Lyon was the capital of the silk trade and manufacturing in Europe and is still a reference for high quality silk. 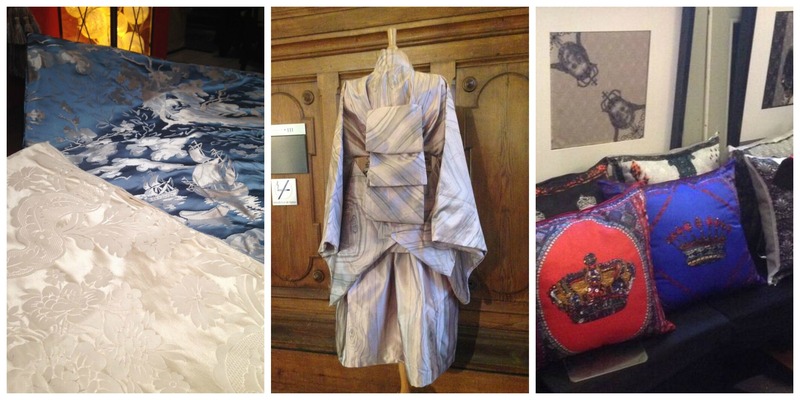 This is a showcase for all things silky, from subtle pocket squares to bold upholstery; there’s even a small silkworm exhibit. 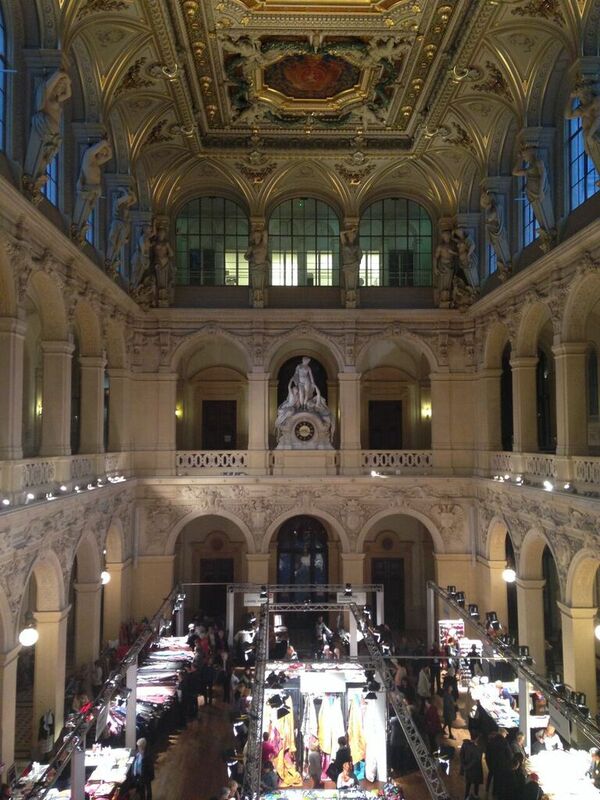 As if browsing through yards and yards of silk from manufacturers like Tassinari et Chatel, Veraseta and Denis et Fils wasn’t exciting enough, it’s held in one of the most beautiful buildings in town. Le Palais de la Bourse, built in 1860 in the center of downtown Lyon, was originally home to several different commercial enterprises, including silk brokers. The impressive architecture features arches, sculptures, gorgeous painted ceilings and grand staircases so it’s the perfect setting for showcasing sumptuous silk. 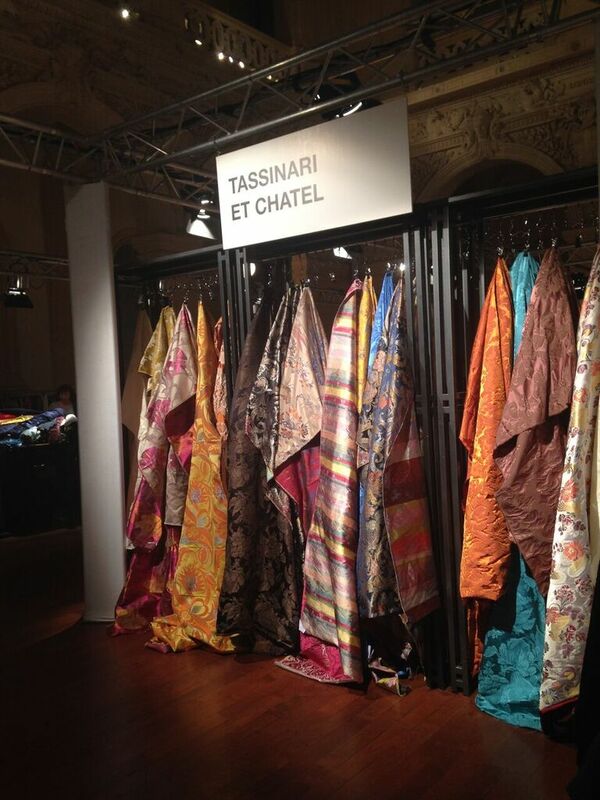 After sorting through bolts of silk, remnants, ribbons, scarves, ties, purses and pillows we came away with a few yards of silk (pictured below, left) from Tassinari et Chatel and plan on making some very special things. Do you like wearing silk? Decorating with it? We’d like to hear your thoughts. Just click on the title of this post and the comment form will open at the bottom of the page. I use a cornmeal mix and follow the directions listed on the package except that I substitute buttermilk for milk because I love the flavor it provides. Now, don’t judge me on this recipe as there is a lot of butter in it. I have confessed and now can proceed. Once the cornbread is baked and cooled, break it into small pieces. Sauté the onion, bell pepper and celery in the olive oil and then stir them to the cornbread. Add the herbed stuffing mix to the cornbread mixture and stir. Pour the melted butter, chicken stock, and soup over the cornbread mixture and combine all ingredients. Stir two eggs into mixture. Place in a 9 X 13 baking dish. Bake for 45 minutes on 350° or until warmed though. Here’s the 411: if you want to prepare this in advance, as I have done today, omit 1 can of the soup, the second 32 oz. 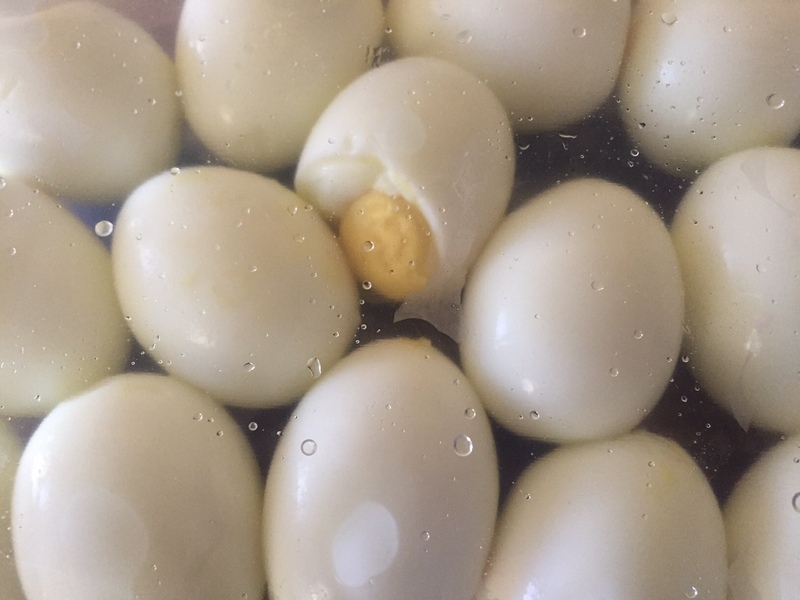 box of chicken stock and the eggs. Cover it very tightly and place in the freezer. A day or two before serving, place it in the refrigerator for thawing. Once thawed and when you are ready to bake it, add the soup and eggs and additional chicken stock if needed for moisture. I usually have mine swimming in chicken stock before baking and afterwards it is very moist and delicious. So there you have it! That’s how I make the dressing for our family. There was a question/answer report on Thanksgiving dinner on the news this morning and one of the questions was how do to make dressing without it being gummy. Well, I think the key is lots of moisture and the extra chicken stock seems to do the trick. 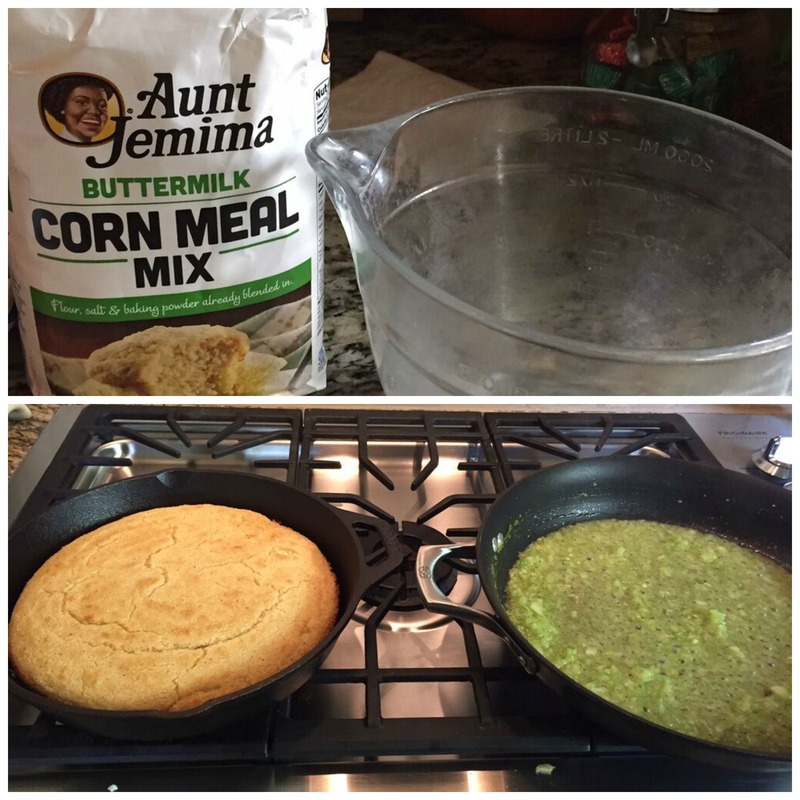 Cornmeal Mix – I like the Aunt Jemima brand cornmeal mix. I prefer the yellow cornmeal but as luck would have it Kroger did not have a yellow cornmeal mix. What is up with that? They do know it is Thanksgiving right? Oh, I’ll reserve getting on my soapbox about Kroger for another post! 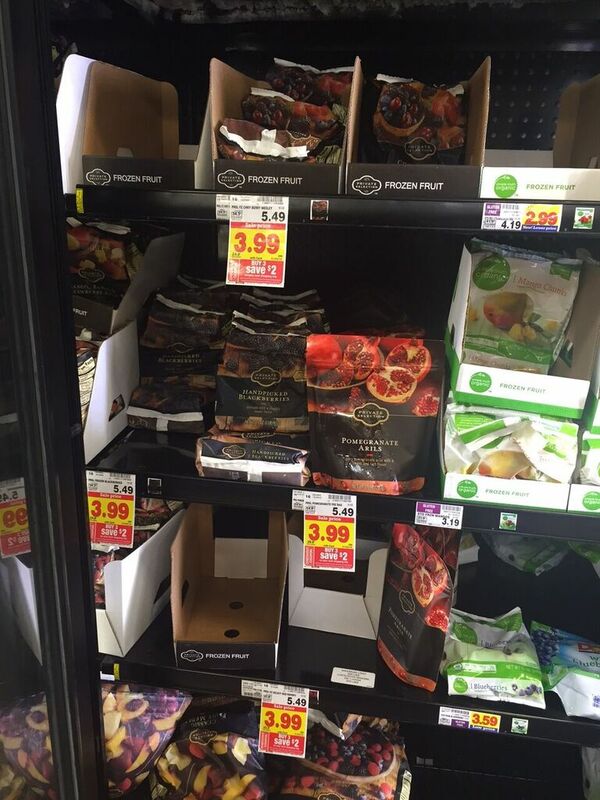 You may not have a Kroger where you live, but I am sure your local grocery has some of the same issues. Later. 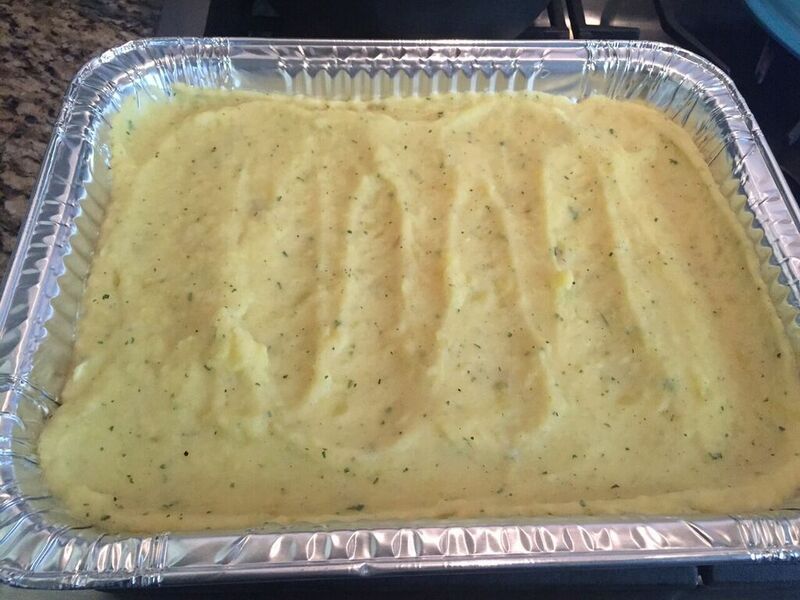 Cooked Cornbread and Veggies – Look at that beautiful cornbread! You must cook this in a cast iron skillet. If you don’t have one….stop what you are doing and get one. Make sure you get a pretreated one that is ready to go. When I got mine you had to “cure” it yourself…it’s like giving it a patina in a day but nothing creates a good patina like time and use. The onions, celery and bell pepper were sauteed until soft and they really the dressing tasty. I hope to be able to share some of my other recipes with you. Besides the Strawberry Banana Salad, all of these recipes are mine. I have tried to transmit this dressing recipe the best I can, but if something does not make sense leave a question in the comment box. 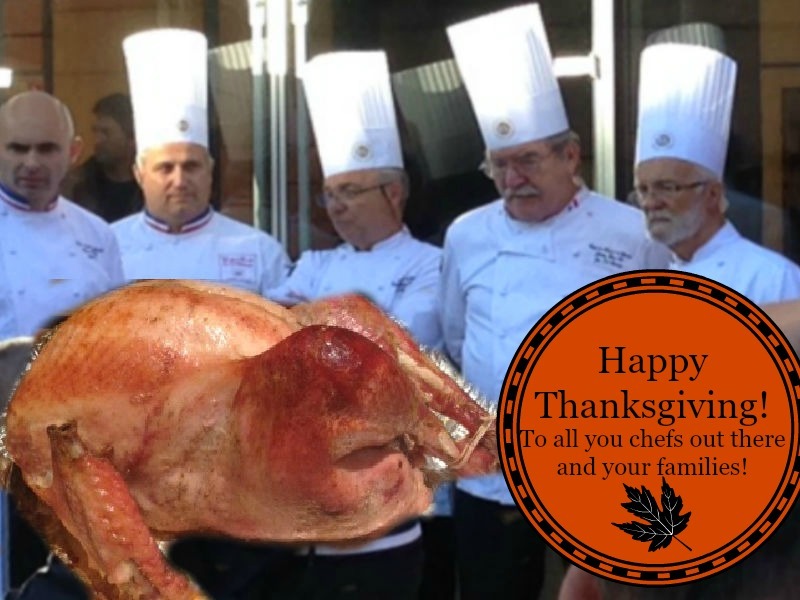 We would love to know what everyone else is cooking for Thanksgiving, so let us know in the comment section. Maybe you are getting my subtle hint about leaving comments? Click on the title of the post and the comment form will appear at the bottom of the page. 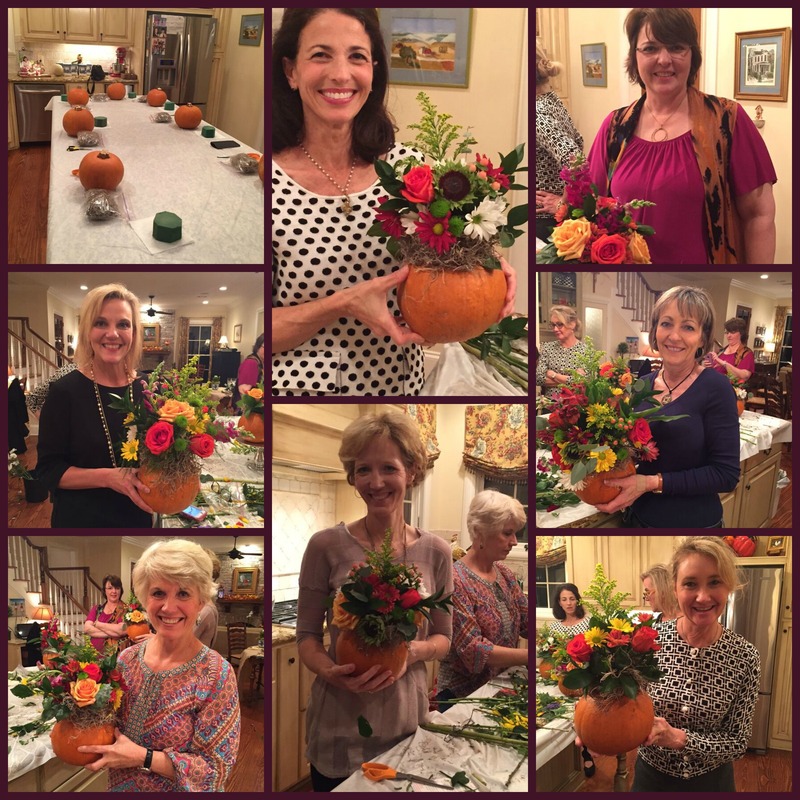 November 19, 2015, posted by Gina – Last night I had the opportunity to present floral designs and tablescapes to a really fun group of ladies. A big thank you goes out to our lovely hostess who prepared some fabulous appetizers that were enjoyed by all, including me. I presented how-tos for variety of different designs that would carry through the holiday season; a round centerpiece, a cornucopia, a long-lasting Christmas arrangement, two tablescapes (one with a pumpkin centerpiece and the other with a cornucopia centerpiece), a vertical arrangement and a cranberry filled vase. A tip for the vertical arrangement is to start with a bit of tall greenery in the back and then step your flowers down. I added a lemon for a bit of fun. When working on a cranberry filled arrangement, first fill a vase with cranberries and then fill with water. You won’t need oasis or a tape grid as the cranberries secure the stems. How cool is that? Coming up….I plan on posting tutorials on how to make a cranberry filled arrangement and a long lasting Christmas arrangement in preparation for the holidays, so stay tuned and check our Tutorials Page in the coming days. We like to hear from our readers, so if you’d like to leave comments or share your thoughts click on the title of this post and the comment form will appear at the bottom of the page. 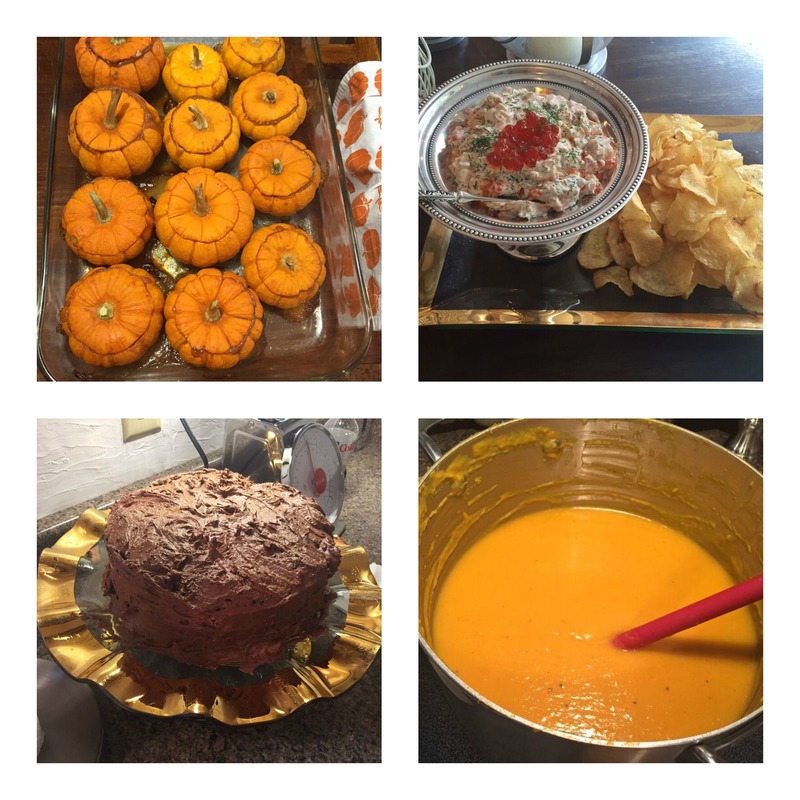 November 17, 2015, posted by Gina – A couple of weeks ago I had the wonderful pleasure of attending my cookbook club’s monthly luncheon. The theme for the day was Thanksgiving and it was a true bounty of the season’s best. 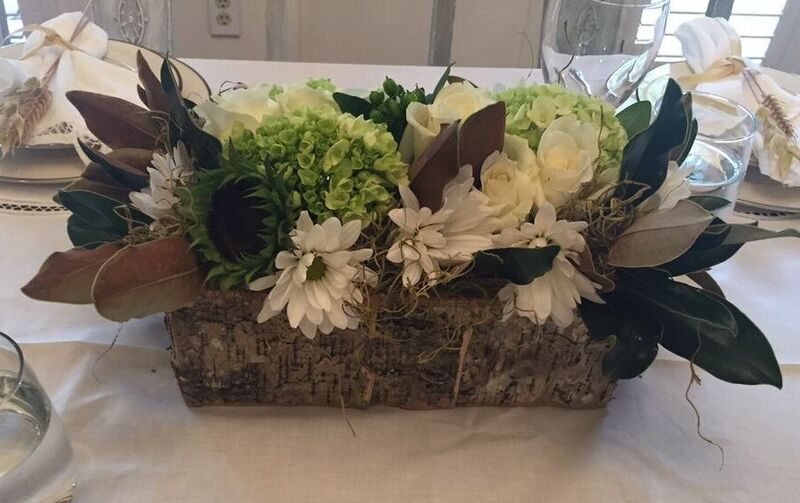 I was asked to design the flower arrangements using cream, green, brown and neutral colors. It was challenging and refreshing for me to work with this color palette for a Thanksgiving feast since it’s a departure from the traditional oranges, reds, and golds. I found some great looking birch bark planters and chose Little Gem magnolia leaves as the backdrop because of their wonderful brown back coating. Hydrangeas, roses, hypericum berries, and white mums were the stars of the arrangements. To add interest, I removed the yellow petals from the sunflowers to create a brown and green flower. 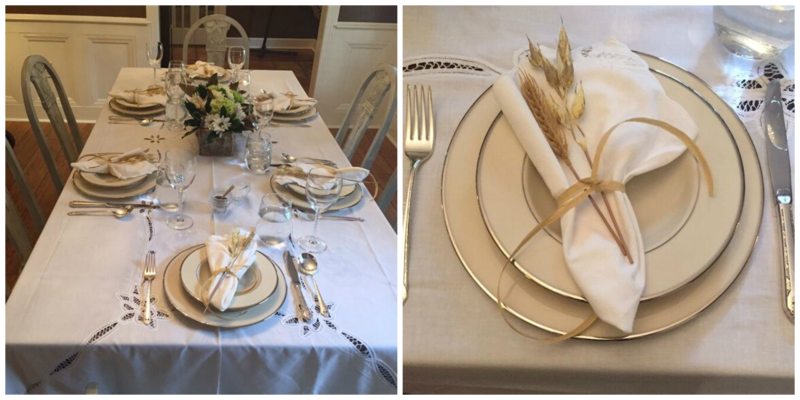 My friend set her tables with beautiful white table linens and tied wheat to the napkins. It was a great touch and really set the mood for the harvest feast that followed. CLICK HERE to go to our Recipe Page and read about all the dishes that were served. How do you decorate your table for Thanksgiving? 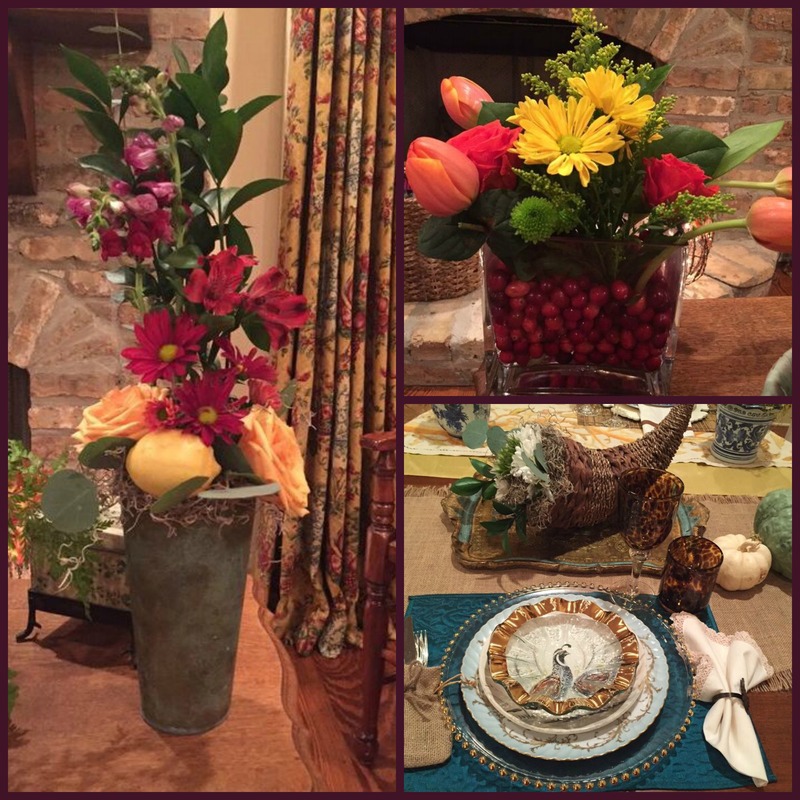 Do you look for new twists on the standard Thanksgiving decoration or do you like the traditional look? Let us know, we’d love to hear from you. Just click on the title of this post to and the comment form appear at the bottom of the page. 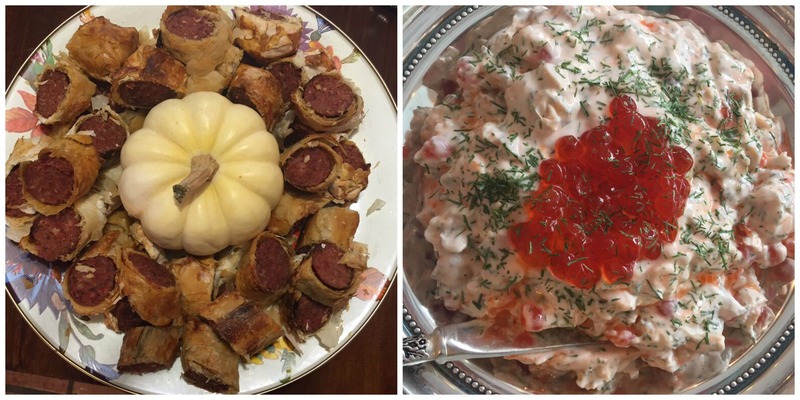 November 17, 2015, posted by Gina – A couple of weeks ago our Cookbook Club gathered for a Thanksgiving luncheon. All of the recipes for the day came from one of three Barefoot Contessa Cookbooks; The Barefoot Contessa Cookbook, Barefoot Contessa Parties! and Barefoot Contessa Family Style. We have been cooking our way through these three cookbooks for almost a year and we all love the recipes. Ina Garten, aka Barefoot Contessa, writes easy to follow recipes with imagination and a sense of style in presentation. We feel like we know her. We enjoyed our appetizers outdoors as the day was very nice. Deer sausage was a substitute in the Lamb Sausage in Puff Pastry recipe because lamb sausage was unavailable in our neck of the woods. They were nonetheless delicious and hearty. Our other appetizer was Caviar Dip which was fabulous. It is made with salmon roe and was very creamy. We then moved on to the soup course; Butternut Squash and Apple Soup. You would have thought that lots of cream and butter went into this soup but there’s not one ounce of cream and only two tablespoons of butter for the whole 3 ½ quarts the recipe yielded. I am not a big apple eater so I had my reservations about this soup but they were quashed upon my first bite. It seemed very rich to me and a little goes a long way in my opinion. It was the perfect orange color and its flavor was spot on for a harvest lunch. Our main course did not disappoint. 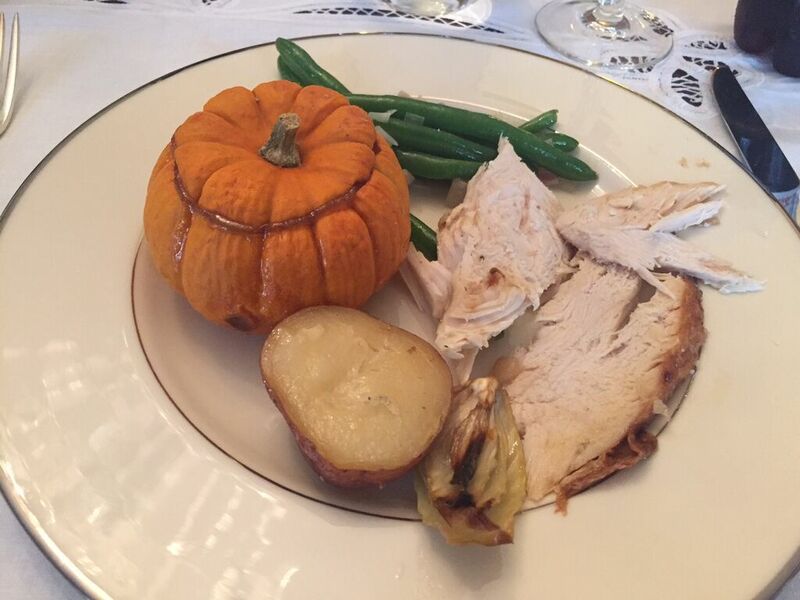 Perfect Roast Turkey, Roasted Baby Pumpkins with Homemade Applesauce, and String Beans with Shallots made a perfect plate. Where to begin? First, the 12 pound turkey was so moist and was only roasted for 3 hours. Ina goes into a bit of discussion about how this is plenty long enough. Potatoes, carrots and fennel were cooked alongside the bird and they added a great flavor. The Roasted Baby Pumpkins with Homemade Applesauce were out of this world. Again, I am not a big lover of apples, but this applesauce had a rich velvety smooth texture. The presentation on this was just so perfect for a Thanksgiving feast. The green beans were super fresh and, along with the shallots, very good. They say you eat with your eyes first, and this plate sure provided a beautiful array of colors. But the feast didn’t end there.Two desserts were offered; a delicious Chocolate Buttercream Cake and Pecan Squares. You may think that pecan squares are fairly ho-hum but these are very different and decadent. I truly recommend you try them and advise cutting them into small pieces as they are very rich and satisfying. If you are looking for a Thanksgiving menu that has a few twists on the traditional fare, this would be a very good one to follow. The flavors, colors and aromas will certainly ignite all your senses. Have any questions or comments? We would love to hear from you! Just click on the title of this post and the comment form will appear at the bottom of the page. 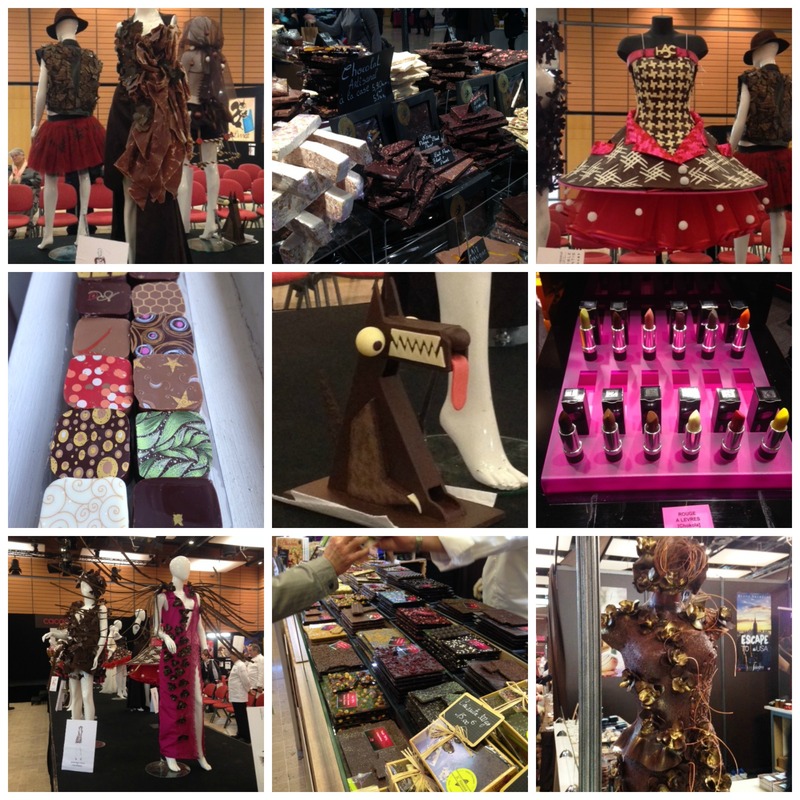 Mais oui…those dresses are made out of chocolate or have chocolate detailing. And they’re not just for show – there are two fashion shows each day but I was hours early for the first one so I didn’t get to see girls actually modeling them. One designer even made a chocolate dog to sit next to his dress. And those “lipsticks” are also made of chocolate! Most of the very well known Lyonnais chocolatiers were set up there; Bernachon, Voisin, Bouillet, Saladino (provided links for the curious). But I bought a small box of 14 different beautifully decorated chocolates from a chocolatier called L’Art Chocolatier from the South of France. Some of the flavors included violet, lavender honey, red wine, Sichuan pepper and lemon meringue. Oh la la! There were also a few chocolate making workshops, demonstrations and of course, all the chocolatiers were handing out samples. I almost overdosed… there are worse ways to spend a Friday afternoon! Are you a chocolate lover? Do you have a favorite local or regional chocolate shop? Let us know about it by clicking on the title of this post to open the comment form which will appear at the bottom of the page.